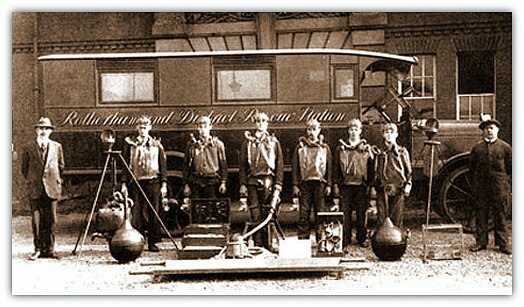 Maltby Colliery rescue team photographed at the Rotherham and District Rescue Station in the early 1920s. Chanters Colliery disaster, March 1957, I was 17 at the time, moved later to Maltby in South Yorkshire, finished due to closures in Lancashire coal mines about 1968. Worked Maltby 7 years, 2000 employees employed at Maltby, I worked 1000 yards down they said conditions were warm, if that’s warm I wouldn’t like to be in a hot place. 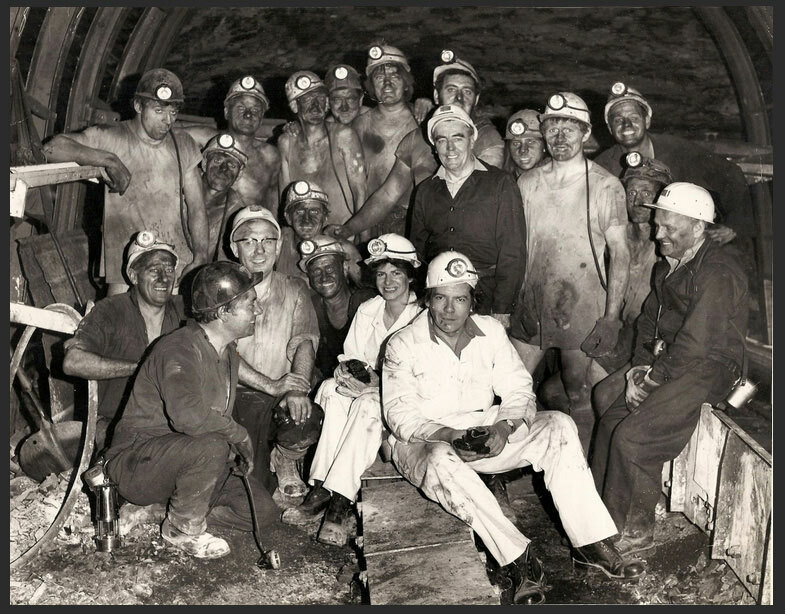 Worked from 400 yards, 800 yards and 1000 yards down, also went down a drift mine for a days training in methods, then transferred to Dinnington Colliery South Yorks till closing down in 1990, 700 worked there. Photo, below, Maltby Colliery SO5’s face, Barnsley seam loader gate rip prior to face 7 foot high seam. That’s me end mid row near guy sat on stage loader pan sides. The machines on the face run on compressed air, same as firing coal, bad explosion in 30’s I think, methane pumped out of the pit to gasometer adjacent to pit. Visit was by lord and lady Scarborough, good memories and mates. Now living in Florida, USA for past 10 years. Managed to get old deputies oil lamps with striker on it, worked 5 different pits, between Lancashire and Yorkshire, seen many, many different methods of working as I said lots of years underground haulage to repair work, coal face development worker, lots skills no good anywhere else. Maltby Colliery SO5’s face, Barnsley seam loader gate rip prior to face 7 foot high seam. Maltby Main, Maltby, Yorkshire. 28th July 1923. The colliery was in South Yorkshire, about a mile to the east of the village of Maltby. There were two shafts which were sunk to the Barnsley bed which was the only seam that was worked at a depth of 820 yards from the surface. Both shafts were 20 feet in diameter and the output of the colliery prior to the disaster was between 14,500 and 16,000 tons per week. Coal was wound at one shaft, the downcast No.1 and the upcast No.2 Pit Bottom was in the process of being equipped for coal winding. The section of the Barnsley Bed, in the District where the explosion occurred, was a roof of bind, inferior coal and dirt about 1 foot 5 inches thick, the seam which was the section that was worked, 1 foot 3 inches of Top Softs, about 6 inches of dirt, 1 foot 5 inches of Top Brights, 2 feet 7 inches of Hards, 4 inches of Bottom Brights and 4 inches of coal and dirt, making the total section that was worked about 6 feet 4 inches. The floor had 1 inch of parting dirt and 2 feet 6 inches of inferior coal and dirt bands. The seam was a gassy one and inclined to give to sudden eruptions of gas. At the time the seam was not considered to be liable to spontaneous combustion and only four gob fires had occurred since the coal was first reached in 1911. The general direction of the dip of the seam was to the east at about 1 in 20. The workings were divided into eight districts, the Low East, The Middle East Left District, The Middle East Right, South East, South West, West, North West and Top East Districts. The coal was worked on an advancing longwall system with the distance between that gate road usually of 40 yards. Packs were built on either side of the gateroads to 3 yards wide with the crossgate packs 4 yards wide. Eighty five percent of the coal was won by hand, the remainder worked by compressed air driven coal cutting machines. No shots whatever were allowed to be fired in the mine, The haulage was of the endless, main and main tail systems. The East and West Main Endless Ropes were driven by electrical haulage engines, situated close to the intake pit bottom. The remaining haulage engines were compressed air driven main and tail and main rope engines and 19 ponies worked in mine. The ventilating current was produced by a Capel fan, 12 feet 6 inches in diameter, running at 177 r.p.m. The fan was driven by a steam engine with an electrically driven stand-by fan. The quantity of air entering the mine recorded on the 13th July 1923 was 114,271 cubic feet per minute going into the Main Intake, 82,464 cubic feet to the split intake, 116,056 in the Main Return and 91,272 in split return. There was no record of the quantity of air that was actually finding its way at the time of the explosion into the area affected. No naked lights were allowed in the mine and there were 2,223 Oldham Electric Lamps and 250 ‘Marsic’ double gauze oil lamps made by Messrs. John Davis and Son Limited, of Derby. All the lamps were fitted with magnetic locks. An electric lamps was issued to each workmen and in the normal course of working each stall, they were supplied with a flame lamp. The station for re-lighting flame lamps was at the surface. The colliery was under the control of the managing Director, Mr. W.B.M. Jackson with Mr. B.H. Pickering as manager and Mr. M. Gabbitas, undermanager. There were two overmen on each shift, one on the West side and the other on the East, who held Second Class Certificates. In addition there were 35 deputies. Before the explosion there were 2,689 men employed, 2,214 underground and 475 on the surface. The day shift from Monday to Saturday descended between 6.25 to 7 a.m. and ascended between 2 to 2.30 p.m., the Saturday day shift descended between 5.25 and 6 a.m., the afternoon shift descended between 2 and 2.30 p.m. and ascended between 9.30 and 10 p.m. and the night shift descended between 9.45 and 10 p.m. The deputies were also organised into three shifts, the day shift worked from 6.30 a.m. to 2.30 p.m., the afternoon shift from 2.30 p.m. to 10.30 p.m. and the night shift from 10.30 p.m. to 6.30 a.m. There were 122 workmen below ground on the morning of the 28th July employed in building stoppings and related work. In the normal course of work, the morning shift deputy descended at 6.30 a.m. and allotted work to his men at the pit, when he descended he made the inspection prior to the start of the afternoon shift between 12.15 and 2.15 p.m. and after the inspection, set the afternoon men to their places, in co-operation with the afternoon deputy, which descended at 2.30 p.m. The afternoon deputy made his inspection of the district before the start of work on the night shift between 8 and 10 p.m. and then allotted the night shift men their duties. 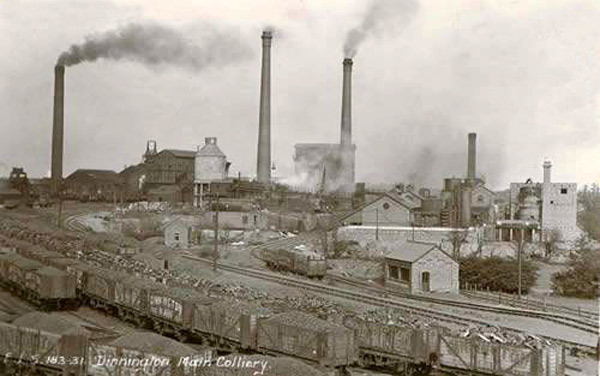 Extensive stone dusting was carried out at the colliery and for some time prior to the date of the explosion, 24 tubs of stone dust per week had been found sufficient to keep the roadways in compliance with the requirements of the regulations as to the precautions against coal dust the stone dust used consisted of Dinnington bind, ground in a stone crusher at the surface. In 1921-2 there had been two fires and heatings in the West and North West Districts. These were dealt with either by digging out the heated material or the erection of stoppings. On the 26th April, 1922, there was trouble from a gob fire in the Low East District. The gob stink was reported in the 60’s airway and to deal with it dirt packs were built at the entrance to 60’s stall and at the end of the airway leading to 21’s level. When this had been done, the manger thought that the trouble had been contained. Meanwhile, owing to this occurrence, certain alterations were made to the ventilation. The long ventilating current which passed along the faces of the Middle East, Low East and Top East Districts was shortened and instead of passing on to the Top East District, it was short circuited down 60’s cross gate into 29’s slant and back to the upcast pit bottom. This alteration, agreed by the agent and the manager required the Top East District being ventilated by a separate volume of air entering from 7’s by the North East intake and passing along the faces into 21’s were, with the air passing out of the Low East, it travelled to the upcast shaft. On the 7th May, even with the previous efforts, gob stink was discovered about 80 yards further outbye at 52’s on the one side and on the other at 102’s near the end of 21’s level. Further packing was carried out and 102’s was ‘gobbed up solid’. In 52’s airway 8 feet of sand was placed between two 14 inch brick walls. After this there were no disturbing reports made until the 16th or 17th May, when the manager received a report that smoke had been found coming from the left hand bank in 60’s at 1 a.m. He went to the pit straight away and gave instructions for a dirt and sand pack to be put on the left side of 60’s to dam back the smoke. He superintended the work for 5 hours but became ill from the effects of the noxious smoke and fumes along with an overman, Nathan Gill and both had to be given assistance to get out of the mine. As a result of this the manager was not able to return to work until 23rd May. In the meantime additional packing was done and the place sealed off under the superintendence of the agent, Mr. Pickering. While this work was in progress it was arranged for the air to be coursed or short circuited along old 25’s gate and from there into 60’s cross gate. On Sunday, 20th May, smoke was again discovered coming from the left hand pack side opposite the East Gate in 60’s cross gate. Some more sand was rammed into this place which stopped the smoke for the time being. Mr. Jackson, the General Manager, and Mr. Joseph Humble, the Consulting Engineer, were sent for. This was at 6.30 p.m. and after 4 hours’ discussion, it was decided that nothing could be done until they could go down the mine the following morning. Accordingly an inspection was made on Monday 21st May by Mr Jackson, Mr. Pickering. Mr. Humble and others, who descended the pit about 10.30 a.m. On arriving at 60’s cross gate they found evidence of a certain amount of heat on the left hand side of the pack of 60’s cross gate. The firedamp had reduced to just under 2% but the gob stink was still evident in 21’s right hand bank. After this inspection a conference was held and it was considered that if the packs and stoppings were thoroughly and strongly made, that would be enough to stifle the fire. A further conference attended by the Miners’ Representatives, was held on the 22nd May, when the general situation was discussed. Another underground inspection was made. Smoke was again issuing at the same place in 60’s cross gate and men were trying to stem it off by ramming sand into the crevices. This operation proved difficult for as the sand dried quickly it dribbled out. Some heat had also been located during the night at a right hand gate pack in the same cross gate. Sand had also been applied there. It was the agent’s opinion that the work of stowing up the cross gate should proceed with all possible speed. The men engaged in this operation were working in relays. The air was very warm and the percentage of firedamp present was 2%. On the 23rd May, the manager returned to duty and an inspection was made by him accompanied by the Alderman E. Dunn and Mr. Hugh Ross, the Miners’ Representatives. They found the blocking up of the old cross gate in 21’s completed and it looked like a satisfactory job. In the 21’s bank they found the sand packing making good progress. As there was still evidence of gob stink just outbye of 102’s, it was arranged to raise up 21’s road to bury the packs and also, if possible, to bury a break out from which gob stink was issuing. 60’s crossgate was then inspected. It was found that the road had been stowed up to 25’s gate and it was arranged to stow as much of 25’s face gate as possible. The conditions were considered to be favourable and this work was continued during the 24th to the 27th May. On the 28th May, the manager found definite evidence of fire in the 60’s cross gate. The ground was hot on the left hand side of that gate. On pulling out some bricks, he discovered the bottom coal, which was not worked, and an old wooden chock on fire. He dug out a tub load of bottoms, really ashes, and after removing some of the burning timber, quenched the material with water. He filled the hollow made by the removal of the ashes with sand, and as these operations seemed to stop the fire for the time being, the work of gobbing up the roads continued. On the fire being found in the bottom coal it was decided to dig a trench further outbye to stop the fire spreading in that direction. The trench was dug and filled up with sand behind an 18 inch brick wall. The digging of this trench, disclosed for the first time, that the bottom coal 2 feet 6 inches thick which was abnormal. When the trench was completed the management continued removing timber and allowed the roof to collapse and gobbing up the roads. This was hoped to arrest the fire.